It fits with what I saw of gymnasts recovering balance (3-Jan-2019). Maybe I could fluff it into some “deep and meaningful” statement, but let’s not. Back to the 30 day challenge. 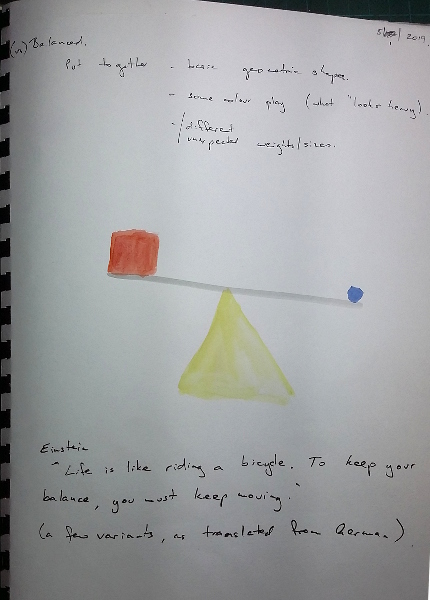 What does unbalanced/precarious/… look like? A classic approach, with basic geometric shapes and primary colours. Can I fool the eye / expectation by mixing materials to play against size | weight expectations? The dark blue was a poor choice for the small but heavy round fishing weight. I didn’t anticipate the impact of the line of the cardboard (used to block the distracting background). It adds to the feeling that the right side is sloped down, heavier. It was actually really difficult to get this to balance long enough to take a photo, even with some tactical use of bluetac. An upset in motion provides a more dynamic photo. I also tried a couple of drawings to see if I could get something more interesting to happen. Not convincing. This version was easier to photograph, as it was actually quite stable. A slight change in the cropping of the photo makes it a little more dynamic. The blue disc is no longer centered, reducing the sense of balance, plus the full shadow seems to be reaching up and almost pulling the tip down. More balancing of simple shapes. The large egg, possibly fragile (actually rubbery) and the small disc. Yawn. This was another difficult one to photograph, as it wasn’t very balanced. The failure is more interesting. On reflection I realised my theme is meant to be un-balanced. The last few days were way too literal and way too static. Reading about Yayoi Kusama in Part Object Part Sculpture. A couple of snippets: “One is lost in a sea of apperceptions, as haptic and optic no longer seem demonstrably different from each other.” “… allows one, how counter-intuitively, to lose one’s boundaries …”. This had me thinking about the loss of balance as one disperses in the seriality and repetition of the environments created. Which led to consideration of precipice/unbalanced/danger as a loss of orientation. 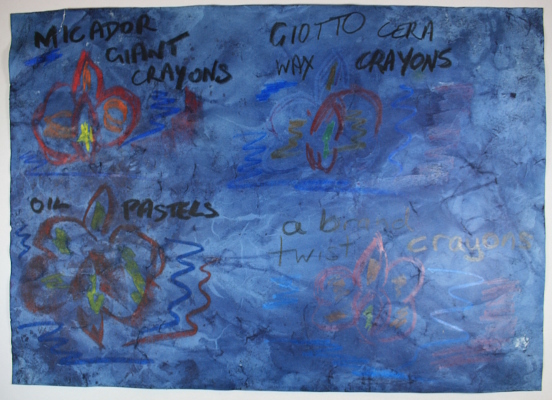 Which led to Tony Tuckson, the sublime, Rothko – work which fills the vision, which I sway in front of. The shimmering movement. Leading to the shimmers and distortions and teasing gaps in the vision before a migraine. Which does actually circle round to danger and loss of balance. Having got this far, I noticed the reflections on the little corrugated piece on an earlier experiment. With movement or lighting changes or a bit of breeze that could give a shimmer. Some kitchen foil, folded to fit through the little corrugating press. It was then carefully unfolded. The result was firmer when forming a new shape (those clever corrugations!). The changes in direction caused by the different folds create points of interest. Tried some more complex pre-folding, to get more changes of direction. Day 8’s experiment was used as a stand. The photo looks rather static. Close cropping doesn’t help. With some extra shimmer from a breeze and some thoughtful, maybe flickering lighting, this has potential. Could using it in a mobile increase the flickering I was thinking of? I made some more pieces of corrugated foil and put them on an early mobile conveniently hanging nearby (see 26-Dec-2017). A lazy photo gives a blurred indication of the result. Plus: The foil is light and the large surface area collects any air movement going. This mobile is constantly on the move. Con: Mobiles are all about balance, not un-balance. This version floats gently in space. Possibilities: More complexity. A wider space, more pieces flashing and flickering past each other. Random puffs of air from the ceiling, creating a bit more vertical as well as rotational movement. Complementary (strobe?) lighting. Add colour to try to get reflections. Also: Take a look at stabiles. My attempt 9-Sep-2017 has a gawky, ungainly, risky looking movement to it. The foil on the left above went through the corrugation process twice, unfolded and refolded between times. The surface is a bit less regular, the reflections broken up a bit. A small change, but could be a nice refinement. Thinking about loss of balance, I attempted to give an idea of a spinning top losing speed and balance over time. The sequence or passage of time is indicated by scale and intensity of colour. The “shadows” added later provide a lot of information to the eye. The whole thing doesn’t quite make sense, there isn’t enough variation and plausible change, but somehow I accept it. A reo-wire figure was quickly put together, with a total disregard for actual body proportions. It allowed some quick and easy posing with fishing line and blu-tac. There’s a lot of cricket on TV at the moment, hence a “catch” as the first pose. I like that the shapes formed aren’t necessarily physically possible with muscles, tendons, etc. I’m definitely interested in the lines and proportions of the human body, suggested but incomplete or not quite right. Our minds put a lot of work into interpretation as something well known. An actual photo of an amazing catch was the basis for this outline. Given foreshortening the proportions seem a little out. Note again the impact of shadow, assisting interpretation. This wireframe plan was based on a photo, still and full frontal, so at least in theory should be close to “real” proportions. I wonder how much variation there is in practice. This week I’m going to summer school, Anatomy for Life Drawing. Hoping it will provide lots of relevant inspiration. 1-Jan-2019 included a dot point about ongoing research on the pivot / balance point / precipice / knife edge / danger / unbalance idea. 4-Aug-2018 has more words – Precipice, counter balance, leverage, impetus, precarious, shimmer, shiver, glide, hesitate, teeter, catch (of breath), instant of focus, moment of coherence and balance, the space between – spark, pivot point, point of balance (mobiles! ), tipping point. 22-Jul-2018: Play with balance. Go for risk, the precipice. I prefer my humour whimsical or quirky. Push beyond the first idea. Surprise yourself. 14-Apr-2018: my brief for Confluence – Capture that moment of coherence and balance when everything comes together just before it all flows apart. 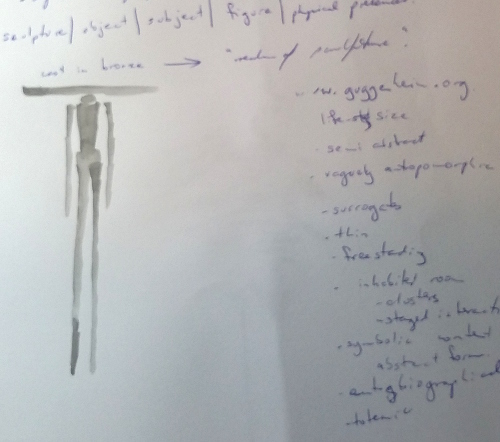 Back on 26-Feb-2016 my research on Gillian Lowndes identified an attraction to Unbalanced; balancing act; teetering; precarious – and included a small brief. That led on to my whole approach to the final assignment in the OCA Mixed Media for Textiles. * illustrate off-balance most days and document for 30 days. A photo from a search on unbalanced provided the basis for this pencil sketch. Trying out placement of “blocks” in watercolour. How much is enough to give the impression of disaster about to strike? That final block at the top appears almost stable/static. A search on images of gymnasts provided forms that are more balance-in-motion. The gymnast couldn’t have held that position, but the sequences were generally controlled. Of more interest but not used here were videos analysing movements of gymnasts fighting for balance on a balance beam. An initial flailing of limbs was quickly turned into a more flowing sequence of movements, recapturing balance. This silhouette was made in gimp, based on a photo. Reading and general workbook activity has been continuing throughout. One of the joys of the summer break is having some more time. Hope the momentum continues. With all my fiddling on components over the past few months, I never got far in actually making something. This current project was intended to get me unstuck, and initial signs are positive. I’m actually interested in trying this out. Having got the new shelving pretty much level and balanced, tried playing with marker and watercolour looking for minimal expression of unbalance. Doesn’t look too promising. Unpacking some old OCA work to start filling the shelves, it was interesting to see how many played with asymmetry and pushing the notion of balance. I love the defiant lines (“plastic horsehair”) escaping up and out. Materials from that time continue to be important, especially the resin. Heat-distressing techniques too. Building and destroying. I’m not convinced that either of my attempts look particularly unstable. 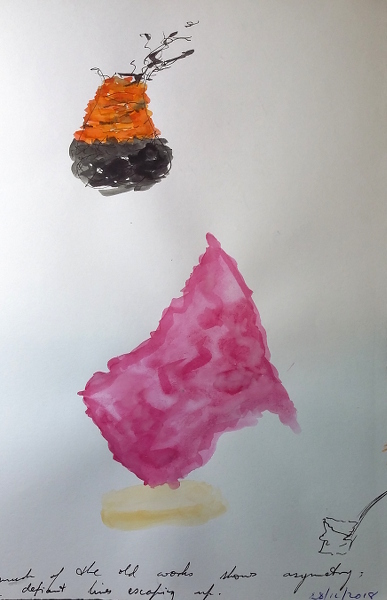 A photo of a mountain climber was the basis for the day’s watercolour. Ideas progressed on actually making, incorporating some of the materials and techniques from the OCA samples. I’ve also been thinking about my motivation for wanting to base lines on the human body. Looking around at past work, the body appears again and again. I don’t have a compelling message or wider purpose in my art. On the other hand, the body fascinates. People are so unfathomable, and no matter how closely I look it gets me no further in understanding. I don’t think I can read an individual’s life in their face or body, but I keep trying. Another attempt to use reduced lines to show unbalance. Not convinced. 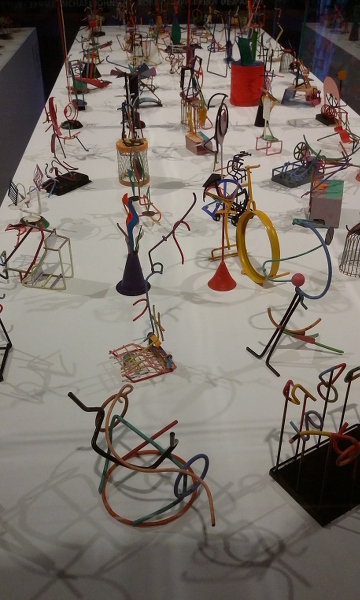 On a visit to the Mosman Art Gallery for its part of Destination Sydney: Re-imagined, I was entranced by Robert Klippel’s small sculptures. I’m sure I’ve seen them in the past, but this time round the impact was much greater. Strangely enough, in all this world of intricate and quirky forms, pretty much all looked balanced. The was a sense of sturdy whole-ness. It had me questioning my obsession – but not enough to change course. Instead when I got home I tried once more to find simple lines that illustrate unbalance. 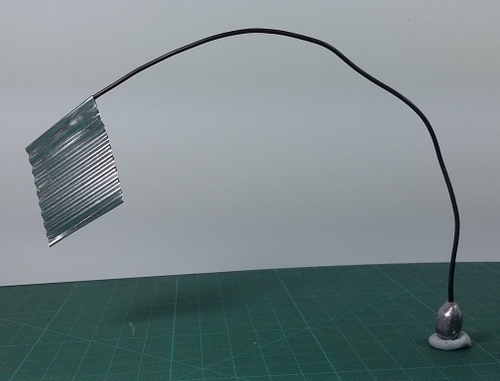 The next step was to try to create something like it in wire. There were modifications as I tried to minimise the “foot” of the object. This variation attempts to play with visual weight. The base includes a fishing sinker – heavy for its size. The end “flag” is very thin metal – not much more than foil. The structural use of blue-tac isn’t exactly elegant, but at the moment quick improvisation seems key. Postscript: while searching back in the blog for “balance” I found 29-Aug-2018, titled “Walking in circles” and excited about Part Object Part Sculpture and Alberto Burri. Fast forward to 1-Jan-2019 in which I wrote about circling, Part Object Part Sculpture and Alberto Burri. Blimey! It’s lucky I’m ambivalent about the whole concept of “progress”. A watercolour by Bela Ivanyi, Boab at El Questro (Kimberleys WA), a finalist in the Wynne Prize 2018 currently being exhibited at AGNSW. So much energy, exciting marks, texture and layering! The build | draw response cycle, recommended by Matt Bromhead and as I was trained in the OCA classes. Matt displays his drawings together with the sculptures. I was more interested in really focusing on my samples as part of the selection process for further development. Oh dear. I had some ideas about how to create texture with watercolour and wax crayons. Not good. So I tried again, just trying to create texture. Meh. Watched a youtube video by Jean Lurssen on creating texture in watercolour using acrylic ink. I quite liked the results – perhaps I’ll make some background pages to get things moving. Went to charcoal and pencil, more directly what Matt taught. I managed a limited range of different textures, but they don’t add up to anything in this attempt. Why would I show and keep such weak work? it’s my process. Writing this helps me think about what I’m doing. I live in hope – maybe one day I’ll look back and see how I’ve improved. I achieved my objective. I’ve spent time looking closely at my samples. I know that slanted grid from Marion Gaemer’s workshop is pulling me. I know the resin platform is important to me. I know the gentle lines and folds of the plaster warm me. I can’t remember if I clearly articulated the component approach in an earlier post. I want to embrace chance, intuition, and thoughtful play. 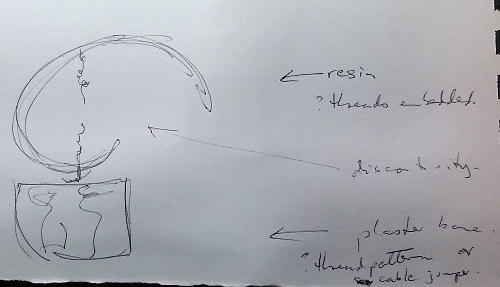 Processes I like, particularly at the moment looping, take time. So I’ve been spending time making components which are then available to incorporate quickly while I’m building. A mini conversation with Kath in the comments of my last post (4-Aug-2018) started a train of thought. Spending some quality time looking at and attempting to draw the samples has given focus. I’ve got some questions and ideas around combining looping and resin shards. For her recent birthday (2-Jul-2018) my mother was given beautiful cards, some hand-made, many with personal comments and wishes. I’ve now bound the cards together so that she can easily display them and re-read all those lovely thoughts. It turned out pretty well, the trickiest part being figuring out how to handle all the different sizes of card. Over the years I’ve tried lots of different book formats for storing workshop notes, visual diaries, exhibition leaflets… Some of it’s by date, some by subject. 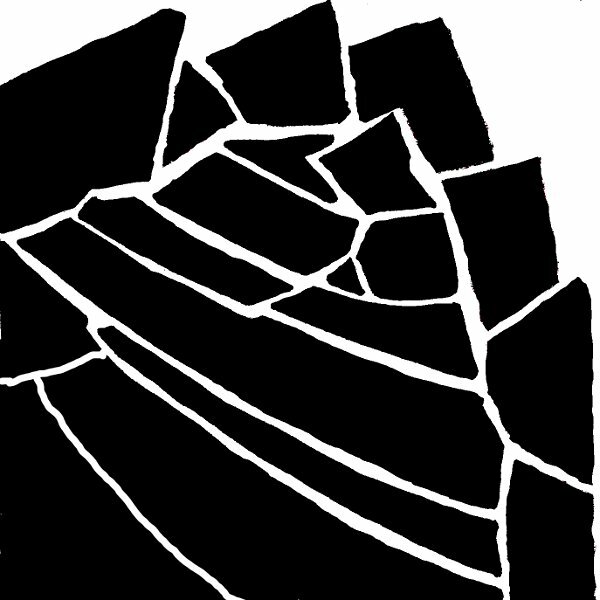 Cannibalizing from a draft blog post for a project that hasn’t quite taken off yet: Recently a son asked me for the name of a glass maker we had been interested in a while back. 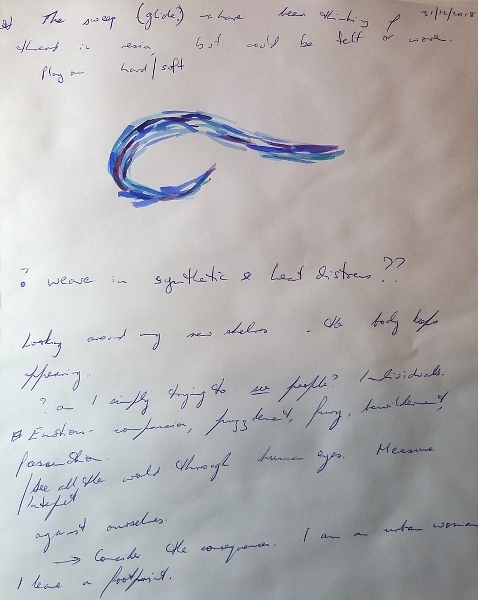 I was able to identify John Ditchfield from a photo of a glass frog in my very first visual diary – 2003, just after I drew a line under my professional studies. That’s 15 years of sometimes obsessive making, learning and experimenting. And flipping through my diaries, looking for this frog photo I had in my head, was a revelation. Some of that stuff was really interesting. I was impressed by myself. Instead of constantly reaching for the next glittery thing that catches my attention, I think it’s time to go deeper, to look around me in my workroom-formerly-known-as-the-dining-room. So I’ve identified value, the resource I’m continuing to build, and I’ve identified a number of problems with the way I create, store and access that value. Seeing the benefit, I’m now experimenting with a system I’ve always rejected in the past as just too ugly. 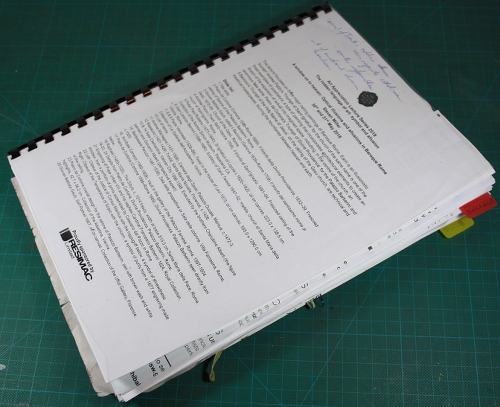 A4 spiral binding with plastic combs. 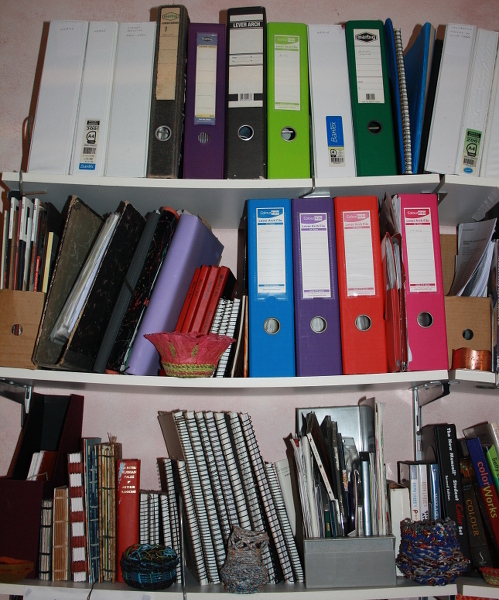 How is that more ugly, more office-drab, more bland uniformity than lever arch folders? Don’t know, it just is. Now I have a thin book with a variety of papers, light enough to live in my backpack. Roughly weekly I take out whatever pages I’ve used and refill with blanks. The used pages go into a larger consolidation folder. There are receipts and postcards and all sorts of oddments going in. At the moment it definitely isn’t beautiful, but at some stage I might play with putting more “arty” stuff in. So far it seems to working – useful. That’s enough. A snapshot of a moment – I want to remember how I got here. For a start Condo talks an awful lot about art history, artists, low and high forms, painting vs drawing etc. While I’m interested in learning about art history it seems artificial to be consciously combining influences in a work. Very “arty”, which is not directly a goal for me. Emotions – I often can’t recognise emotions that people say are in a painting, unless they are simplified down to almost caricatures (which Condo’s own work seems to be). Though I loved his phrase about Rembrandt, about “see the world they lived through in their face”. Need to go to the AGNSW exhibition again and look with that in mind. Loved the use of oil sticks, and then dragging the brush through for tone. Would need to relax and not think about cost, seeing the way he churned through them. Also liked the way the drawing changed as he worked on it – eg one of someone’s eyes became the eye of another head in profile. Interesting the bit about fake news, that we don’t know what realism is. And the phrase “strange shadows” – could really explore that as a theme. But not sure about art being truthful – unless you say it is the viewer’s interpretation so their own truth. It did have me wanting to jump up and draw, and think I might need to do that straight away. Strike while the iron’s hot. Jumped up, grabbed some A3 cartridge paper, some oil pastels, a figure from sculpting class with Kassandra Bossell (breaking off arm and foot in the process), sat on the floor and started drawing. Colour didn’t move with brush so pushed with fingers. And here I am, breathless and excited and blood coursing. Alive and creating. “Result” is not the point, but included for completeness. The point is in my mind and body and emotion. 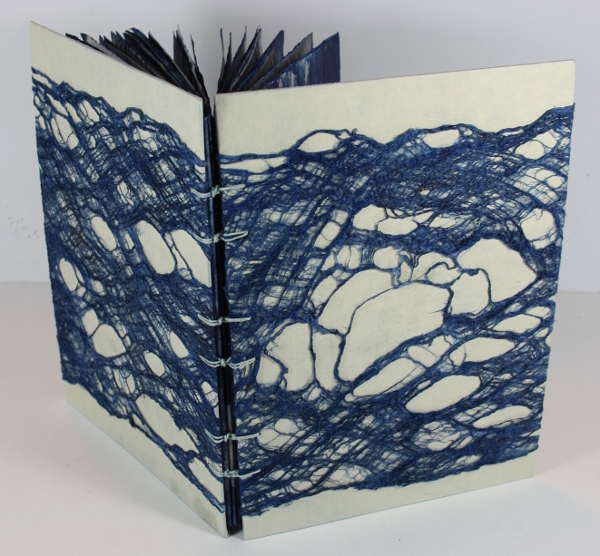 This sketchbook was first seen 9-Jan-2015, freshly made and ready to go. Most days since I’ve been working in it, trying different media to see what results I can get. The paper (110 gsm cartridge paper dipped into an indigo vat) was very absorbent. Thin colours like inks and most felt-tip pens just soaked in leaving little trace. The surface was very fragile. If the paint on a stamp was too tacky the paper’s surface would lift away with the stamp, leaving white paper, rather than the paint being deposited on the surface. The surface would also lift if the book was closed while something was still tacky, with the paint adhering to the baking paper between each page. It was hard to find the right media in the right colours to stand out against the busy patterning of the surface. 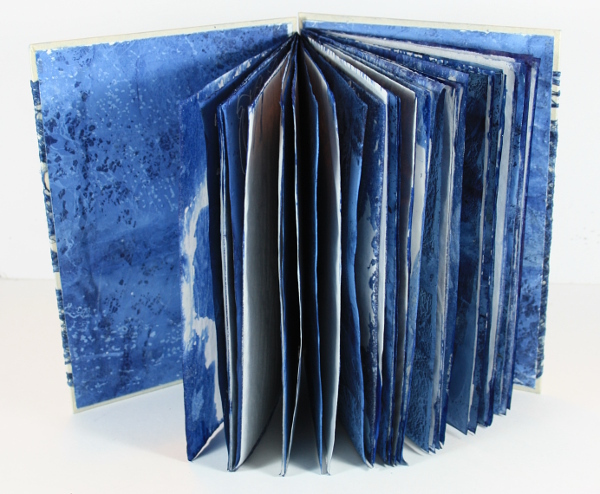 It was easy to lose the beauty of the indigo patterned surface by covering too much with opaque media. Stamping with lumiere products. 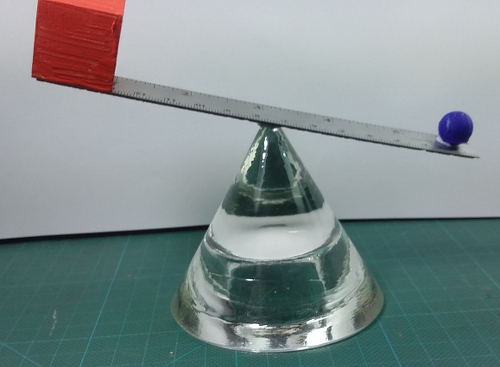 Glue and foil lifted surface. 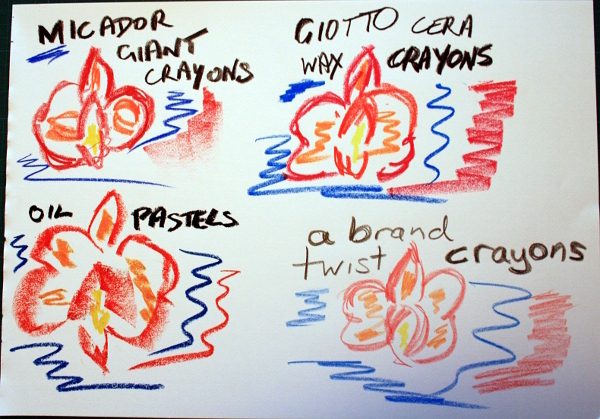 Conte crayon. Banksia at Kiama. Trying for bold, strong lines. Liked the silver, so stitching webs/stars in various metallic threads. A little micro-pearl in “sky”. Finishing up the acrylic paint, using a plastic card. A simple monoprint in acrylic with retarder gel. Better when not throwing everything at it. A couple of sketchbook pages didn’t make it in. Some were basically repeats. One was overstamped in indigo, which was awkward to do into the book format. The separate A3 page on the left was much better. 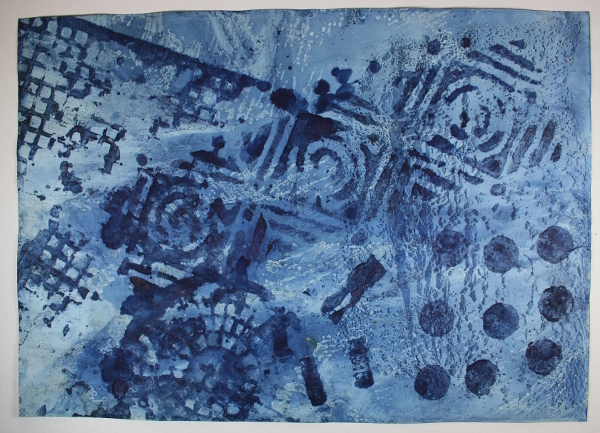 I really like the effect of the layers of indigo – the initial full dip, then dips of various found things as stamps. Another extra followed a suggestion from Nola to use coloured crayons as a resist before dipping into indigo. The results from my quick test were unexciting and I haven’t done a followup. I think more solid areas of colouring would work better, as well as sticking to the lighter colours like yellow and orange.